Paradise Camp 23 is a space-core project headed up by Mandragora label pres Erik Amlee. This is psychedelia of the harshest sort and not for the fainthearted. Amlee does an impressive job of incorporating all the elements of classic acid psych and electronic space into a mind shattering noise and industrial stew. Imagine a collaboration between F/i, early Alien Planetscapes, and The Residents, with dashes of the earliest Pink Floyd, and you might get something like Paradise Camp 23. 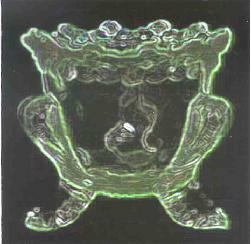 While the sounds are seriously aggressive, there's actually a lot of activity for the attentive listener to explore. All the sounds are distinct and have an identity rather than being a huge senseless assault that serves no purpose but to lobotomize the listener. Loads of cool freaky space tones come together with various strange samples of voices and other sounds to create a sonic landscape that can be as dark as it is cosmic. Paradise Camp 23 also has it's lighter moments consisting of relatively ambient noise excursions. And if you've made it through the first three tracks and are still enjoying the ride, then tighten your safety harness for the lengthy 47 minute title track. 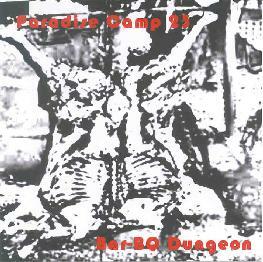 Fans of the 80's space/noise artists who took meditative space and didn't so much turn it on its ear as they did rip it out will want to give Paradise Camp 23 a listen. 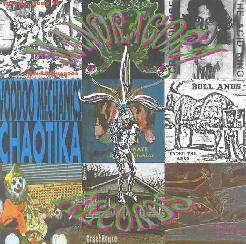 Crackhouse was a more purely noise oriented psychedelic band of Amlee's that existed from 1988-1994. Recorded in 1989, "I" is duo project of Amlee and David Gilden on guitars, synths, and samples. I don't know if it's a coincidence or if Amlee just likes 47 minute long excursions, but "Black Light Discipline Room" hits that mark being a lengthy freakout that makes me think of Hendrix letting it go in the moments after he discovered feedback. This is pretty tough to take for a full 47 minutes but psycho acid guitar assault fans may find a lot to enjoy here. Crackhouse have lots of interesting ideas and my favorite parts were when the guitars and whirling space synths were serving a backing role to a voice sample monolog about drug sales that sounded like something from Dragnet. But Amlee has clearly come a long way over the years, producing much more cohesive improv excursions with Paradise Camp 23 and utilizing the noise elements as part of something larger and more varied. I did enjoy the remaining three shorter track on the CD. "Leatherface" features bubbling spaced out acid guitars that produce a chainsaw effect along with blood curdling screams. Hmmmm.... wonder what influenced that one? The remaining tracks are similar to the epic track but make concise statements in several minutes rather than running on for too long. The Mandragora Sampler is not what you'd expect. Rather than being a simple compilation of artists from the label, Amlee sampled a selection of tracks from the Mandragora roster into a freaky mix of his own. This actually has some of the calmest music on any of these discs, though no less strange. Dark astral space drones, tones, clatter, noise, and voices create a steadily evolving drama that's loaded with fun freaky sounds and often has a thematic feel. I hear industrial, space ambient, out of control acid freakouts, oddball Residents styled voices, and big gloms of all these things. There's some seriously spaced out music on here and one of the best parts is near the end when we hear what sounds like an army of flying saucers racing against multiple layers of ambient waves and drones. Lots of interesting stuff here and Amlee does a good job of holding my attention throughout. The action is continually shifting but Amlee makes the transitions seamless. There are 5 tracks but checking the Mandragora web site it looks like each includes several bits of tracks from various artists from the label. Indeed there's no breaking point even between tracks so I enjoyed this disc as a continual work rather than giving me direction toward any individual artist on the label. I think the message is to just go for it and start exploring some of the tasty oddities Mandragora has to offer. For more information you can visit the Mandragora Records web site at: http://www.mandragora.com/. There are lots of sound files and the Mandragora folks also host the EXCELLENT Weirdsville Radio which you can find at: http://www.weirdsville.com/. Contact via snail mail c/o Mandragora Records; PO Box 936; Northampton, MA 01061-0936.